China's fledgling shipbuilding industry is set for more hard times as industry insiders have indicated that the global shipbuilding industry is unlikely to recover in the near future. New shipbuilding orders received by China in the first quarter of this year fell 98.3 percent year-on-year to 0.19 million deadweight tons (dwt), according to Clarkson Research Service. New orders worldwide in the first quarter have fallen by 97 percent to 1.33 million dwt. "New orders worldwide will be less than 5 million dwt in the first-half of this year and it will be quite optimistic if the figure reaches 15 million dwt for the full year," said Zhu Rujing, researcher, China Shipbuilding Economy Research Center. 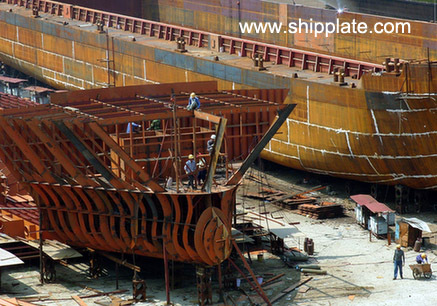 Zhu estimated the 204.6 million dwt orders Chinese shipyards have pooled by the end of 2008 will decline to 150 million dwt. "The global shipbuilding depression will last three years at least, or even more than five years," Zhu said. Although major shipyards in China have pooled enough orders for production till 2011, order cancellations may increase as clients are facing cash problems. "In 2009, Chinese shipyards will deliver vessels of 56 million dwt as planned, but I guess 5 percent of them will be cancelled," said Zhang Guangqin, president, China Association of the National Shipbuilding Industry. Over the next three to four years, the cash shortage in global shipbuilding industry is likely to touch $300 billion, with the shortage in China around $30 billion, said Li Li, deputy general manager, Shipping Finance Department, China Export-Import Bank. The Bank recently granted credit lines of 100 billion yuan and 60 billion yuan to China State Shipbuilding Corp and China Shipbuilding Industry Corp, the two largest shipbuilders in the country. Li proposed that the government, financial institutes and shipbuilders jointly establish an industrial investment fund for shipyards.